JEROME FREDERICK NALEID, known to all as Jerry, was born in Racine, WI. Both his parents had served as officers in WWI. Brother Jim recalled his childhood days: "Both of us did well in school. We often hiked along the beach with friends. Jerry was well liked. 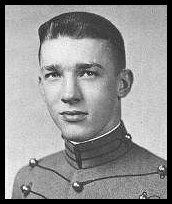 He graduated from Horlick High School in Racine in 1942, then attended the Millard School in Washington, DC before entering West Point." Jerry joined the Class of 1946 on the banks of the Hudson on 1 July 1943. Cadet life presented few problems for Jerry. He excelled academically and when the opportunity presented itself in 1945, he opted for Air Cadet Training. Graduation found him pinning on pilot's wings as well as second lieutenant bars in the Army Air Corps. After fighter transition training in Arizona, Jerry was assigned to Selfridge Air Force Base, Michigan. While there, he was one of 16 AF pilots to fly F-80s on the first Transatlantic Flight and return (Operation Foxable 1). He went to Germany with the 36th Fighter-Bomber Group. During that assignment he returned to marry Patricia Farrell at West Point on 10 December 1949. In 1951, he returned to Turner Air Force Base, Georgia, to serve with the 508th Fighter Wing. Jerry received his Masters in Aeronautical Engineering at the University of Texas in 1958. This was followed by a tour at the Air Force Academy where he taught Thermodynamics. Next the Naleids moved to Patrick Air Force Base, Florida, where Jerry served with the Air Force Missile Test Center. In 1965, Jerry moved to AF Systems Command at Andrews Air Force Base, Maryland. His next assignemnt was at Phan Rang, Vietnam where he commanded a squadron in the 35th Tac Fighter Wing, flying F-100s. For his combat missions, Jerry earned the Silver Star Medal, Distinguished Flying Cross, Bronze Star Medal and 17 Air Medals. From VN, Jerry went to Lakenheath, England to become Vice Commander 48th Tac Fighter Wing. Returning to the States in 1971, Jerry served with the Arms Control and Disarmament Agency, State Department, in Washington, D.C. He retired from the AF in 1976 as a Colonel. After retirement, Jerry and Pat split their time between Washington, DC and Melbourne, Florida. Jerry was then able to play as much golf as he wanted and travel with Pat to all the places they always wanted to visit. Jerry died of cancer on 15 December 2000. Survivors include his wife, Pat; sons, Michael and David; daughters, Kathleen, Barbara and Anne; brothers, Bill, Jim and Bob and eight grandchildren. Those who knew and loved them remember very special people in various ways. That Jerry Naleid was special is reflected in the remembrances of his friends and family. Roommate, Roy Hudspeth recalled: "Jerry personified the academy's motto: Duty, Honor, Country. He loved people and was always helpful to them. He was intelligent with an outstanding personality and character." Golfing buddy, Ray Alfred remembered: "Jerry was named 'Hawkeye' by our foursome. We all agreed that his keen eyesight helped him excel as a fighter pilot. He never flaunted his medals nor detailed his accomplishments during his AF career. - including his 206 missions in Vietnam. During his illness on one of our drives to one his medical appointments, I asked Jerry which type of aircraft he enjoyed flying most. Without hesitation he told me that it was the Stearman PT-17 which was fabric covered with two open cockpits. Then he smiled and said he flew that aircraft when he was a West Point Cadet training at Chickasa, Oklahoma, in 1945. Although Jerry is now 'out of sight' over the horizon in his Stearman PT-17, to his friends he will never be 'out of mind.'" Friend, Ernie Briel, wrote: "Jerry was always there when you needed him. Simply stated, he was a patriot. A passionately conservative American dedicated to his family, friends and to his country. We have lost a great friend and the country has lost a dedicated patriot." Son, Dave, recalled: "My Dad was a tough but loving father. All he had to say was 'You better straighten up and fly right' and we snapped to attention. He was always there when it counted. He never fudged on his principles. I think the training he got at West Point stuck with him his whole life. My father lived by his principles and taught his kids to stand by them." Son, Mike wrote: "I know he is the best of men and one hell of a father. My dad was the one who put his life on the line for us all so that we may live free. He was that way. He was the straightest by the book man, even for us kids. His family was everything to him. He loved to fly above anything else." Daughter, Kathy, remembered: "He was humble and a stickler for details. He loved his family and was quiet and a true gentleman." The Class of 1946 is proud to add the words that our classmate would want so much to hear: "Well Done, Jerry; Be Thou At Peace!"